My husband is going back to school soon and I could not be more excited. Chris is one of those people who is very intelligent but never pursued a college degree. He has settled for jobs that are pretty low paying and often hard on him physically. I know if he had his degree, he could do something he enjoys. He has a few aspirations, one of which is to be a chef, which would be fine by me! We have a few local schools that have excellent culinary art programs and we are excited he will be joining one of them. We have been collecting his school supplies over the summer and the one thing I still had to get was a backpack. I wanted to get him something that was fashionable, durable and perfect for the techie student. With the excellent products from AIRBAC and their ingenious air support system technology, his back will be protected and he will be a styling geek! Troy Christy created the innovative AIRBAC when he saw kids at a local school who had a tough time with their heavy backpacks. He knew this could be quite harmful and he was determined to be lightweight yet functional. The first AIRBAC was a bookbag with a blood pressure cuff sewn in the back., that when pumped, it lifted the backpack to a healthier position on the back. With the patented air support system in the AIRBAC, it allows the weight in the backpack to rest comfortably just above the waistline. This takes the weight off your back and shoulders, relieving the pressure and potential for harm to your lower back. Instead of hunching over, the AIRBACK allows you to relax in an upright position, giving you better spinal alignment. With the patented air support system, each step you take is absorbed by AIRBAC and not your back. 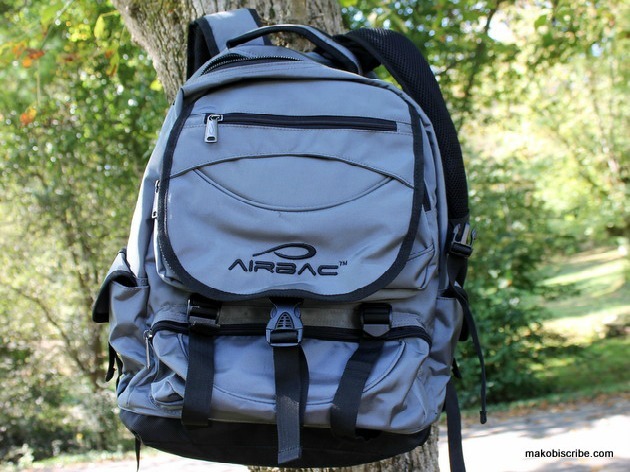 It is not a surprise the AIRBAC was the winner of the 2012 Best Protective Laptop Bag award. I am absolutely in love with the Premiere backpack I got for Chris, which retails for $99.99. I actually had a double duty in mind for the backpack because it is perfect for me to travel with as well as for Chris to use for school. I also have a bad back, so this is perfect for me to carry my laptop, camera, books and whatever else I need to work with on the road. The backpack has pocket clips and Velcro as a security measurement on the main and side compartments as well as three front straps to pull for an extra security feature. The expandable front pocket adds additional room and the pocket fits up to a 15” laptop. The adjustable compression straps make the bag perfect for anyone of any size and the side mesh pockets can hold a large water bottle. This backpack is perfect for the techie student. I cannot say enough about how awesome this bag is and I would highly recommend it to the traveler, scholar or anyone who could use a fine backpack like this. Be sure to follow AIRBAC on Facebook, Pinterest and Twitter for all their latest news. Air-Tech Backpack in Black is my first pick! I would like the Ring Backpack. I would like the Uptown backpack. I like the journey backpack. My favorite Airbac is the Zoom Backpack. This would be ideal for my camera and lenses. I like the Transit Backpack. I really like the Mesh Backpack. I love the Uptown bag. I really like the uptown backpack, thank you. I like the uptown backpack. I like the Transit Backpack! I like the Curve Backpack in the Violet color. The Uptown model in black. I like the pockets and lining. I like the Premiere Backpack in black. I like the Layer Backpack! would love to get the ring or transit back pack for my grandson. I like the Uptown model.It has extra pockets on the back. The AirTech Backpack in red is my favorite. I would love the air tech backpack for my son. It looks so comfortable for him to carry around at school. I like the layered travel backpack. I like the Executive Backpack. The Airtech Back would be great for my daughter in college! The Journey Backpack is my selection. I love the focus camera bag!!! I like the Layer Backpack best, but I wish it would let me see what the other colors look like. I just want to say that Makobi Scribe has some wonderful giveaways! I love the blazer backpack. I would love to have the Curve Backpack in pink for my great granddaughter. I like the Premiere Backpack. The Journey backpack looks pretty great! The layer backpack in the orange/grey/black is nice. I would like a backpack for myself but have a son who could use it more. 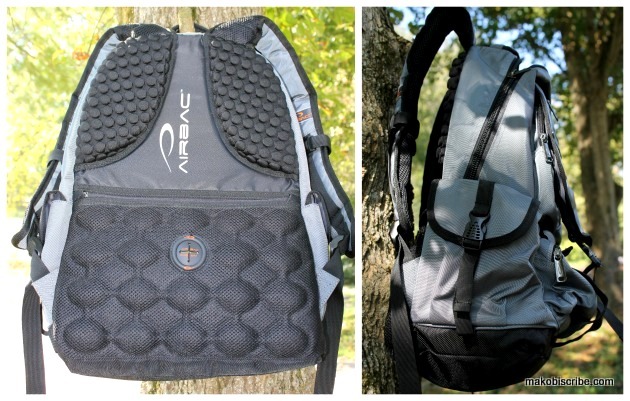 I would choose the LAYER BACKPACK. I’d like the Ring Backpack for my college daughter. I like the Premiere or the Journey backpack. I’d love the Curve Backpack in Pink for my niece. I like the Uptown business bag. Also, tried to like the FB post and thought the entry went thru so I claimed the entry, but then I got this error from FB: You can’t post this because it has a blocked link: The content you’re trying to share includes a link that our security systems detected to be unsafe:Body of an error/warning message. Title is: You can’t post this because it has a blocked linkPlease remove this link to continue. I really like the journey backpack! I really like the Premiere Backpack. Thanks for the great giveaway opportunity. Keep up the terrific blogging. I like the AirTech Backpack. I love the Journey backpack! I would really get some use out of the UPTOWN Backpack, that is the one I would choose. Yes I went straight to the business backpacks and love that Uptown bag. If money were no object, that would be my fave, but a freebie I hope to win is the Premier. My favorite product is the Uptown Business Bag in Black. Very nice looking bag.